Panzerkampfwagen VI (Sdkfz 181) Tiger ausf E Turmnummer (Turret Number) S33 leads Tiger S13 as they follow Panzer IVs in a road march by Kampfgruppe (Battle Group) Lammerding, 8.Kompanie, 2nd SS Panzerregiment, 2nd SS Panzer Division "Das Reich." Note the anti-tank rifle hits on the front armor plate and the "Springender Teufel" (Jumping Devil) on the turret side. These tanks were left behind after the bulk of the Division's surviving soldiers were transferred to France on December 17, 1943 to rebuild after constant fighting since Operation Zitadelle (Citadel) in July. Steady attrition reduced Das Reich to just six Panzer IVs, four Panthers, and five Tigers left for Kampgruppe Lammerding. On December 24, the Soviets launched a massive operation that shattered the Ukrainian Front and threatened to cut off German forces. Generaloberst Hans-Valentin Hube (October 29, 1890 - April 21, 1944) successfully extricated his 200,000 soldiers and inflicted heavy losses on the Red Army, but at a high cost in armor. The Soviets could now concentrate on liberating Kharkov. 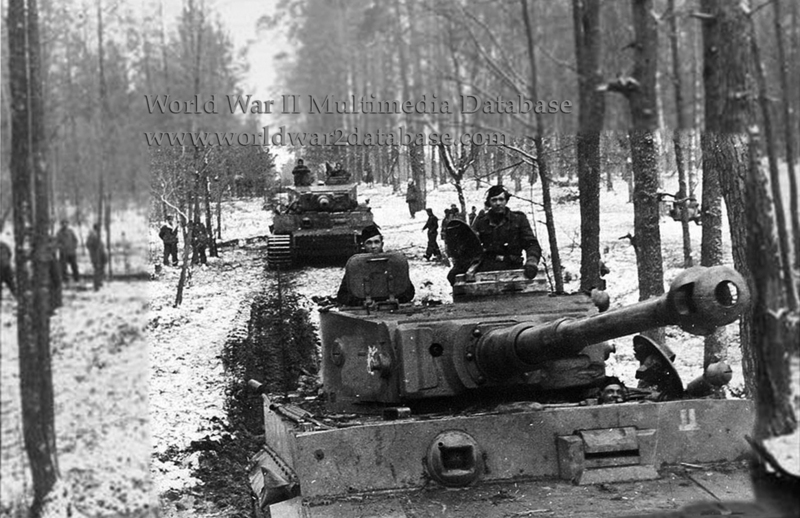 Except for two Tigers evacuated for factory maintenance, all the vehicles were destroyed by April 1944, when the surviving Das Reich men were removed from the Eastern Front to be rebuilt and sent to France.